Ten days after its unnatural genesis, what is already being called the biggest fire in California state history rages on. At least seven individual fires are burning in four counties as of this morning, although some of those started as smaller fires that have now merged. Together, the fires have consumed more than 2,600 homes across more than 1,100 square miles and have killed at least 20 people including one firefighter. Outgoing Gov. Gray Davis called this the worst fire disaster the state has ever experienced, the Associated Press (AP) reports. Several of the fires are finally nearing containment as cooler temperatures and precipitation set in on Thursday and are expected to continue through the weekend. The three worst fires are encircling the state's largest cities: San Diego and Los Angeles. Officials now believe the Cedar Fire, which threatens San Diego, has killed at least 14 people and is the largest fire in California history, began when a lost hunter fired a signal flare into the air. He may face criminal charges. They believe the San Bernadino fires were deliberately set, and rewards of more than $100,000 have been offered for two men believed to be the arsonists. The Moderate Resolution Imaging Spectroradiometer (MODIS) on the Terra satellite captured this image of the fires and clouds of smoke spreading over the region on October 26, 2003. The red polygons indicate precisely where the fires are burning, or have recently burned. Image courtesy Jacques Descloitres, MODIS Rapid Response Team at NASA GSFC. 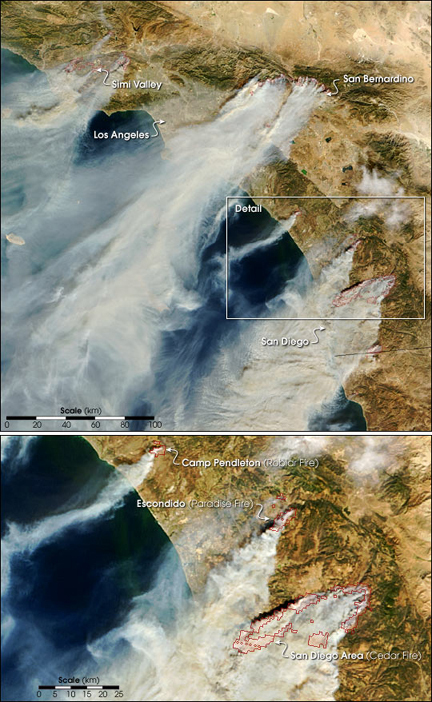 Though unnaturally set, the Southern California fires are part of the forest's natural cycle. Just like rivers have 100-year floods, forests have 100-year fires. Forests traditionally need small fires to burn off plants, brush and shade-tolerant trees. With these natural fires, larger trees survive and grow even taller so when another small fire comes along it merely burns off the low brush: The fire can't reach the tops of the trees and doesn't spread. However, when people suppress these natural fires, the forests become overgrown and, literally, fodder for the next fire. This year, the fire situation worsened as a result of four years of severe drought, fire suppression and a bark beetle infestation. Andrea Tuttle, head of the California Department of Forestry and Fire Prevention, said that 70 percent of the trees around Lake Arrowhead in the San Bernadino Mountains were dead due to an infestation of bark beetles, according to Reuters. The hundreds of thousands of dead or dying trees create an "extreme fire hazard," the Forestry Department reported in a press release back in March. So severe that Gov. Davis declared a state of emergency. When this fall's annual hot, dry Santa Ana winds blew in, they exacerbated an already bad situation. Thirteen thousand firefighters are battling the blazes and equipment and firefighters from other states are joining in the fight daily. Ash and smoke clog the skies, prompting health warnings for children, pregnant women, the elderly and asthmatics. Schools have been closed for several days. In addition to destroying homes, businesses and forests in the earthquake-prone area, the fires have significantly damaged the seismic and stream-gage monitoring networks in some regions of Southern California, according to U.S. Geological Survey (USGS). Since Tuesday, at least four earthquakes have shaken the region: the strongest, in Simi Valley, measured magnitude 3.6. USGS reports that despite the degradation of the network, the fires have not affected their ability to provide timely information for emergency response in the event of a large earthquake. However, the fires have "knocked out communication with at least 60 instruments," says Butch Kinerney with USGS. They don't know if the instruments have burned or simply lost communication due to the burning of a major transmission tower. President Bush declared Southern California a major disaster area, which gives grants, loans and other financial aid from the federal government to the cash-strapped state. Officials report that California is spending an estimated $9 million per day fighting the fires; the total cost could reach $200 million, with a $2 billion toll on the economy, according to the AP. The state was already facing a $38 billion deficit. USGS guesses from preliminary estimates that their equipment loss alone will cost more than $1 million. Thursday's light rain and drop in temperatures helped efforts somewhat but it's still an uphill battle, especially as wind gusts reach 30 to 40 mph. Firefighters are dropping water and flame retardant from airplanes, setting fire lines ablaze to try to slow the fires, and digging trenches and cutting down trees around structures, hoping to create buffer zones. As the fires are receding and rains set in, new threats are introduced: the chances of landslides and floods are significantly increased because soil no longer has vegetation to hold it in place, Kinerney says. The devastating effects of the fire have prompted Congress to action. On Thursday, the Senate passed its version of the Healthy Forests Restoration Act, including a compromise forest-thinning amendment, Environment & Energy Daily reports. The act aims to protect old-growth forests and communities from catastrophic wildfires by reducing the fires' natural fuel  the underbrush and undergrowth  and expediting procedures for thinning operations on 20 million acres of fire-threatened federal lands. The act dictates that at least half of the funding for fuel reduction projects must be used in wildland-urban border areas, such as the San Bernadino Mountains. The House passed its version of the act in May; members of both houses are calling for conference as soon as possible in order to get the bill signed into law before next year's fire season begins. Lawmakers hope the forest-thinning initiatives in the Healthy Forests Restoration Act will help prevent future disastrous fires. In the meantime, firefighters and homeowners continue to battle the blazes in their backyards.